Jessica Westbrook is a northern California native. She received her bachelor’s degree in Plant Biology at UC Davis, with interest areas of plant propagation and ecological remediation. Following her undergraduate work, Jessica worked for Lawrence Berkeley National Laboratory for two years assisting in Carbon cycle research. She then went on complete her PhD in Horticulture at Cornell University. Jessica then participated as a member of the inaugural CCST Science and Technology Policy Fellowship program. 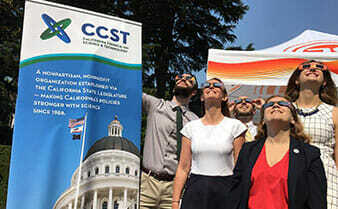 For this program, Jessica was placed on the California Legislature Assembly Committee on Natural Resources where she was responsible for proposed California policy analysis mainly in the area of renewable energy, waste and recycling, state lands, and others. Following the fellowship, Jessica accepted a staff research and development position at Sandia National Laboratories in Livermore, CA where she contributes as a systems analyst on a variety of national security challenges.